Thank you for contacting The Corr Group, a representative will contact you shortly. 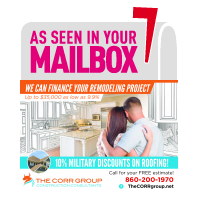 The Corr Group of Wallingford, CT is an honest, reliable general contractor providing any aspect of residential construction with specialization in remodels and additions. We remain actively involved in each phase and ensures everything is completed efficiently to minimize wasted time and materials. Our commitment to our customers is very important to us, and we strive to exceed our homeowners' expectations. The work done on your home is done as if it were our own. We realize knowing how to build a successful relationship with our clients is just as important as knowing how to remodel a room or include an addition to your home. Our dedication to our customers' satisfaction is the key to our success. We pride ourselves on long term relationships with our clients. We are willing to provide references upon request. As a general contractor and home builder in Wallingford, CT we keep residential and commercial customers informed every step of the way to ensure the finished product is everything you envisioned.